Deze Bosruiter werd op 13 juli 2014 gefotografeerd door Jan Bisschop in het Neeracherried in Zwitserland. 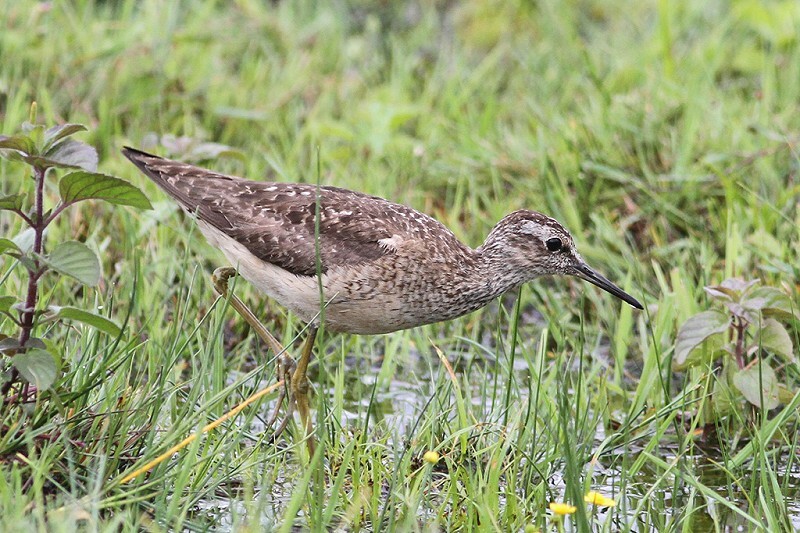 The correct answer for round 9 is Wood Sandpiper. 24 of the 53 answers were correct (= 45%). The following species were also mentioned: Short-billed Dowitcher (11), Long-billed Dowitcher (7), Bar-tailed Godwit (3), Common Redshank (1), Sharp-tailed Sandpiper (2), Eurasian Whimbrel (1), Ruff (1), Great Snipe (1) and Jack Snipe (1). This picture was taken on July 13th, 2014 by Jan Bisschop at Neerracherried, Switzerland. This mystery bird in this round is a (larger) wader species. Most submitted answers were Wood Sandpiper and Short-/Long-billed Dowitcher. The head of the mystery bird appears to be snipe-like and this could point in the direction of a dowitcher. 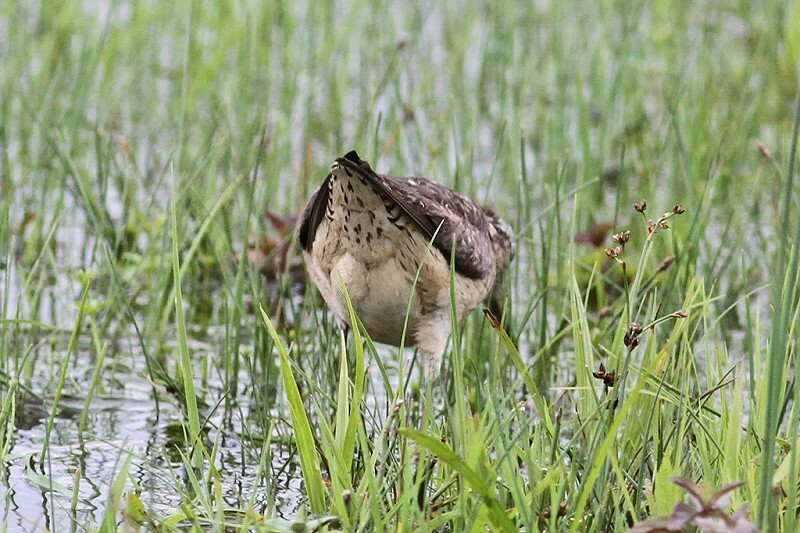 The markings on the undertail coverts and the long greenish/yellowish legs also fit a dowitcher. The bill length is perhaps not clear in the mystery picture since the top part disappears behind the grass. The following features of the mystery bird do however not seem to fit a dowitcher: (1) the very broad white supercilium behind the eye, and (2) the rather dark wing feathers with some white spotting. All the mentioned features fit for Wood Sandpiper. Please let us know if you prefer to have your name removed from the ranking when you are no longer attending the competition.